So What Should a Local Church Do? In my 3-28-08 post I vented. My frustration with the ineptness demonstrated by folks in megachurches who sometimes control the purse strings and make decisions that damage lives and retard God’s kingdom purposes simply boiled over. It was triggered by a very real situation where three families serving very competently and effectively with CRM in diverse areas of the globe were stung by a church last week, which made such hurtful, ill-conceived decisions and then used the l0-40 window as justification. But on a more constructive note, what should a church do when faced with decisions on the allocation of resources for those committed to serving in a missions posture? How do you realistically juggle priorities? What is a church to do? Several years back, I wrote the attached article to address just that issue. It lays out a practical formula and process where such financial decisions can become a “win-win” for all involved. I just learned of another mega-church which is laying waste to people they support who are not directly focused on the 10-40 window. Under the guise of reallocating resources, they are cutting people off who don’t fit their criteria of being on the ground in 10-40 venues. So what’s wrong with such “prioritization?” Plenty. 1. Such decisions rarely have to be “either-or” type choices. They should be “both-and.” I’ve seen too many situations where a church’s financial support for incredibly effective people around the world and in North America, gets cut and the reason given is that the church wants to reallocate resources where the needs are greatest. However, the real reasons are all too often budgets that are stretched because of elaborate building programs, dwindling attendance, or turnover in a missions committee where control of the purse strings has shifted to people who have a personal agenda. The church I heard about today which just cut some superb missionaries serving in North America has been engrossed in a 30 million dollar building extravaganza and felt compelled to begin eliminating missionaries. The justification was the 10-40 window. 2. Most such decisions are made by misguided and myopic amateurs who have created policies that may sound high-minded and strategic on the surface but are missiologically naive and are an indication of leadership that doesn’t know what they are doing rather than leadership that knows how to focus on the most unreached of the global population. If they really wanted to be more strategic, they could do it without the human carnage. 3. Such ill-informed decisions often demonstrates a gross misunderstanding of “leverage.” Such decision makers would probably have given Jesus the ax because he never got outside of his own culture. Patty and I have personally gotten several such “dear John” letters. The most disappointing was from a church that had helped originally send us into a life of vocational ministry, the place where we were married and a congregation that had an incredible reputation for supporting the global Christian movement. In a form letter from someone we had never met, we were told they had “re-evaluated” their priorities and if we ever decided “to live overseas,” we should come back and talk to them and they would reconsider us for support. 4. In my experience, I have never seen a local church cut its pastoral staff or their compensation commensurate with cuts they deem necessary in those to whom they have committed who serve in a missions capacity. People you don’t have to see every week don’t raise as big a stink. 5. When a local church makes such draconian moves which can devastate people already living on the edge, I have never had one pastor or person responsible contact us and be willing to enter into a conversation about the decision. I have never seen a willingness to have these misapplied 10-40 window assumptions challenged. 6. Unfortunately, it is indicative of the fact that local churches are increasingly unreliable and unpredictable sources of financial support for those serving in mission postures. And when they take a valid, useful concept such as the need in the 10-40 window and use it to decimate and wound their existing mission force, it only reinforces the poor reputation that such church-based mission efforts all to often have earned. I can’t help but believe such hurtful actions, like those I heard about today, grieve and sadden God. But in the larger perspective, I think it is all simply another symptom of the underlying condition of the traditional, institutional church in the western world. While the outside of the building was massive and imposing, it gave little hint to the spectacular interior. 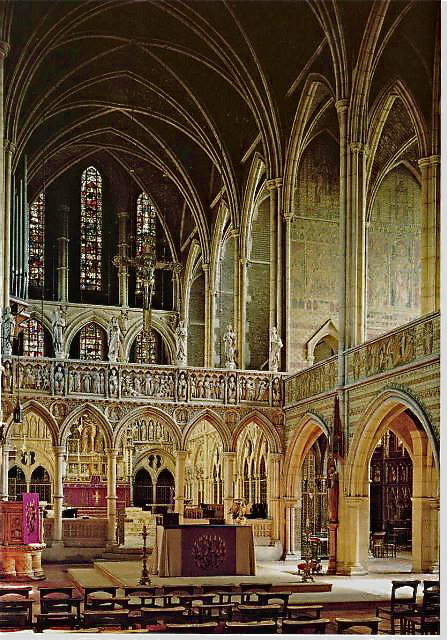 Stain glass, a huge valeted ceiling, and stone and woodwork that were remarkable in their artistic genius. I’ve passed this church building numerous occasions during our stays in London. So yesterday to get out of my hotel and get a break from the computer, I hiked the neighborhood and decided to explore this edifice. I found an open door and went in. It was just me and a lady doing some cleaning. I discovered there are about 130 active members of this congregation in a building that could easily accommodate a thousand. The parish newsletter was even sadder …a ministry that sacramentalizes a dwindling and dying population. Incredibly depressing. From there, I wandered across the street and came across a totally different scene. It was a Saturday morning, open air swap meet swarming with hundreds of people from every imaginable ethnic background. The smells, textures, colors, languages, all made for an incredibly diverse and vibrant setting. The contrast could not have been more stark.